This render shows the internals of the body, with the outer shell removed. The bricks that are not normally visible are in blue. The real MiG-15 has a sweep angle of 35 degrees. 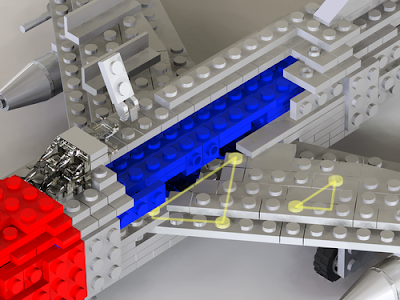 I approximated that with the typical LEGO Pythagoras layout at 3-4-5 stud offsets. This gives an angle of atan(3/4) = 36.8 degrees. You can see the triangle at the wing root (large yellow). The studs marked with yellow circles are attached to the body, from the bottom and from the top as well. Even so the structure is far from rigid. The wing-fences are attached similarly, but the triangle is half the size, at 1.5, 2 and 2.5 stud offsets.